Ricciardo has had a little moment on track at Turn 1. And now Alonso locks up and runs the McLaren deep at Turn 1. A few drivers have done that so much. Thanks Nate. I still don't understand why Ferrari are allowed to have that sponsorship deal at all! @JohnnyB: There's no rule against tobacco sponsorship, just tobacco branding on the cars. any news from Button's garage? @Barkun: Nothing so far. Car still in pieces in the garage. Hamilton's benchmark a 1:21.622. 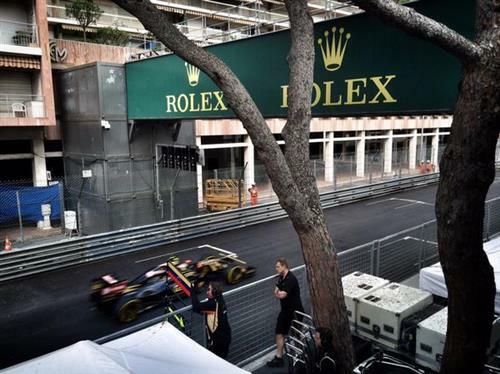 Raikkonen the only man within a second of the world champion, six tenths behind. Ricciardo 1.427s behind. What's your suggestion on having the choice of tyre manufacturer's as in the past. Do you think the Pirelli's contract extending beyond 2016?? @rockedin123: I think having one tyre manufacturer who are tasked with making tyres which degrade quickly is a good idea on the surface but has led to this situation of drivers having to over-manage tyres. A tyre war would be expensive. We're approaching the half hour cut off where the drivers have to give back the extra set of tyres to Pirelli. Rosberg continues, suggesting he's been on a new set of tyres and not the additional set. Button 0 lap - Again in troubles ? @Designer: Seems so, his car was on the jacks and in pieces from the word go this morning. Rosberg now has the track all to himself. @Nate: So I guess your alibi is still holding up for the Hatton Garden raid, mates haven't grassed on you yet? Nate, what's the situation with wider tyres? Are they coming? If so when? @Phoenix: They were in the Strategy Group recommendations for 2017. Nate, do you think Lotus can do good here? Maldonado in particular? @Tommy: Definitely. Maldonado and Grosjean have both been strong here in their junior careers. 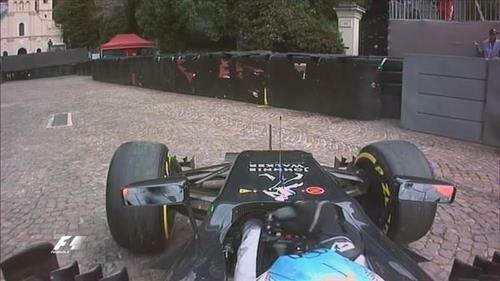 Though the walls being so close to Maldonado does leave me feeling a bit jittery. What about the new title Sponsor for McLaren Ron has been talking about since 2014? Any news? Ooh. Big, big lock up for Bottas as he approaches Ste Devote. He rather theatrically spins the car back around and carries on his way. Lots of drivers testing the limits of the track down there. @Jazzy: Nothing I'm aware of so far. Remember, this is only practice so him being fifth could be down to any one of a number of issues. Rosberg is consistently losing time to Hamilton in the middle sector so far but he finally puts in a representative time and goes second, 0.122s off his team-mate's benchmark. Remember, we won't see the option super-soft tyre (the red striped one) until this afternoon's session when the qualifying simulations begin. Think Massa will be gone at the end of the year? He certainly would fit the bill as Haas's veteran driver. Yep. That's me shamelessly plugging my Twitter feed. Can you give a comparison of times FP1 2015 vs Fp1 2014 ? 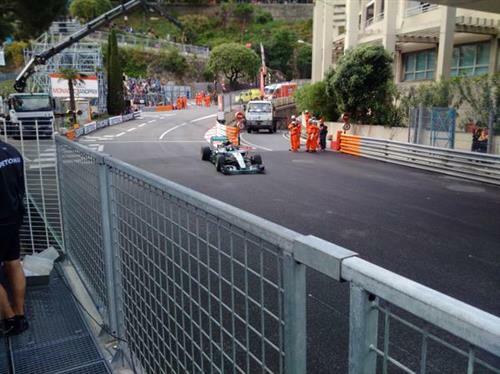 Hamilton topped FP1 last year with a 1:18.271. The times continue to fall in this session and we're nearing that now. Hamilton just knocked 0.566s off his last time to set a 1:19.196. Moments before that Rosberg had pinched top spot from Hamilton but that lasted for a few moments. Hamilton now 0.566s ahead of Rosberg, so he actually knocked even more time off his initial benchmark. Every one keeps forgetting Kevin Magnussen among available drivers. Sure he'd be glad to have a race seat again. @deltaalpha: Again, he's a McLaren reserve driver. This is where the interesting discussion begins about what on earth McLaren do with Magnussen and Vandoorne considering Honda has no B-team. Your DP in Twitter looks old.... College days?? @rockedin123: Ha, that one is from 2011- no idea why it shows up on here! Much more hair then. @Nate. Could you tell me how far behind is Kimi to the two Mercs? @kkunakorn: Raikkonen's best lap is a 1:22.239, which currently is three seconds behind Hamilton but we haven't seen him on track for a while and the track has been getting quicker and quicker in the last 20 minutes as it dries out.